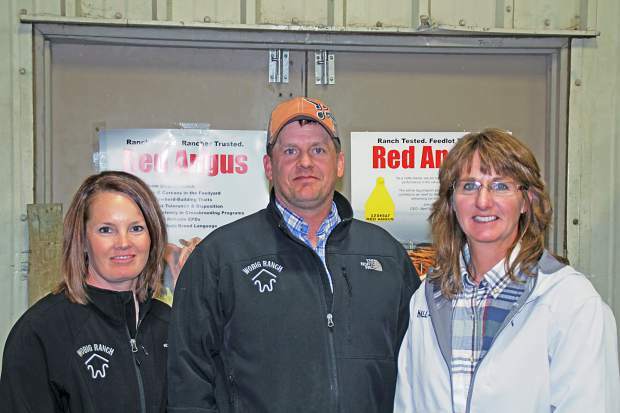 Shane & Heather Wobig, Merriman, NE with sale host Paula Pokorny. Location: Lincoln County Fairgrounds, North Platte, Neb. 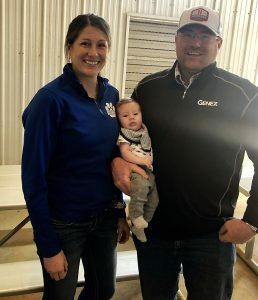 Helen Hall and the Pokorny family had a beautiful day in North Platte, NE for the 39th annual Hall~Pokorny Red Angus bull sale. 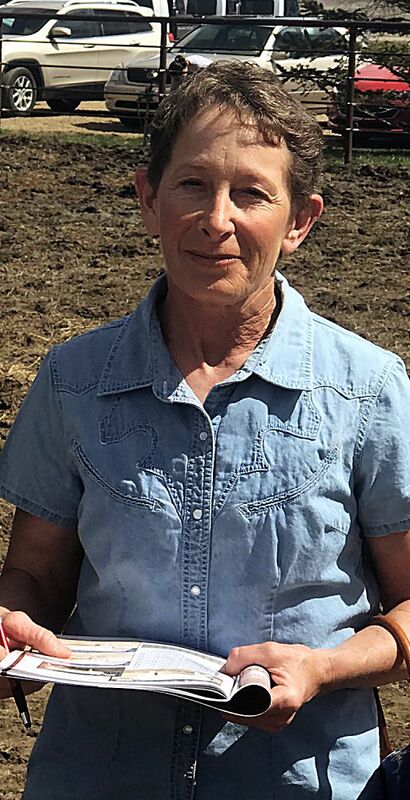 Helen and her late husband Lamoine started this herd of Red Angus cattle in 1976. The cattle have since been purchased by their daughter Paula and husband Brad and their family of three boys. 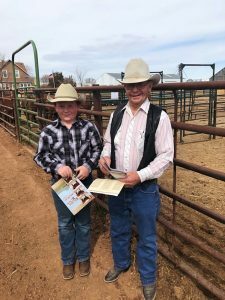 The Pokorny family is doing an outstanding job of following the foundation that was laid for them, raising cattle that will work in all aspects of the cattle industry. 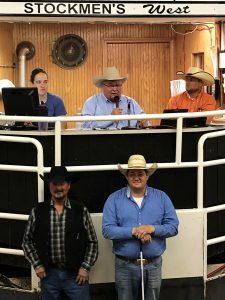 There was a great crowd of buyers and bidders at the Lincoln County Fairgrounds for the sale. The buyers took extra time looking over the bulls and whenever you looked out there were people in every pen sorting through the bulls. This set of bulls had been fed with the rancher in mind. They were hard bodied, showing lots of natural muscle expression, thickness, depth of body and soundness. The bulls were readily bid on and purchased, giving the Hall~Porkony families a great sale. Lot 1 at $26,000 for two-thirds interest & full possession was HLH Right Kind 8271 4135, 1A, Mar ’14, sired by BUF CRK The Right Kind U199 out of HLH Ms Perks 1154 8271 by Perks Chateau 213R. 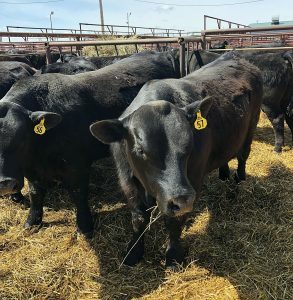 He sold to Cross Diamond Cattle Company, Bertrand, NE and Adolph Red Angus, Mt. Carroll, IL. Lot 23 at $12,000 for two-thirds interest and full possession was HLH Jonny 2114 4023, 1B, Feb ’14, sired by SR Jonny 55Y out of HLH Miss Mac 4046 2114 by BC Mac. He sold to Greg Slack, Harrisburg, SD. Lot 7 at $11,000 for two-thirds interest & full possession was HLH Hughes 8292 4117, 1A, Mar ’14, sired by Bieber H Hughes W109 out of HLH Ms Ice 2057 8292 by Neo-Sho Ice Box L395. He sold to Cooksley Red Angus, Anselmo, NE. Lot 4 at $10,500 for two-thirds interest & full possession was HLH Jonny 2175 4024, 1B, Feb ’14, sired by SR Jonny 55Y out of HLH Ms Bravado 6034 2175 by BUF CRK Bravado U013. He sold to Ted Bentley, Torrington, WY. Lot 15 at $10,500 for two-thirds interest & full possessions was HLH Olly 2025 4061, 1B, Feb ’14, sired by Red SS Olly 554T out of HLH Ms Conquest 0242 2025 by HXC Conquest 4405P. He sold to Bob & Deena Rodewald, Sheridan, MT. Lot 27 at $10,500 for two-thirds interest & full possession was HLH Hughes 8133 4145, 1B, Mar ’14, sired by Bieber Hughes W109 out of HLH Lady Lance 5064 8133 by BUF CRK Lance R102. He sold to Kravis Red Angus, Korval, CO.